“How To Experience Victory In Your Storm” from Christian Faith Publishing author Lelia M Broughton reveals the power all people have. By showing readers how to activate their powers, Broughton inspires and empowers readers to overcome the struggles they face. 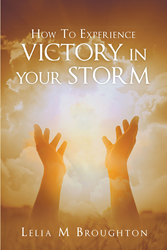 “How To Experience Victory In Your Storm” is the creation of published author, Lelia M Broughton. Lelia is a first-time author, part-time student, and full-time mom who continues to add to her repertoire. A philanthropist at heart, Lelia founded Children’s Youth Center (CYC). CYC is a nonprofit organization based in Pittsburgh, Pennsylvania with the mission to encourage and empower youth through the knowledge of God and mentorship. By acknowledging her purpose in evangelism, she can offer a unique approach that exudes with compassion and sincerity. Lelia is a sincere friend who instantly and effortlessly connects with all who she encounters. Life has not been easy for Lelia. She does, however, manage to persevere by refusing to live life as nothing less than a victor. The victory people need to survive their storms is assured. The victory is already theirs. “How To Experience Victory In Your Storm” is crafted to help readers activate and use the power they already have. By the end of the book, readers should know for a fact that all things are possible through Christ. View a synopsis of “How To Experience Victory In Your Storm” on YouTube. Consumers can purchase “How To Experience Victory In Your Storm” at traditional brick & mortar bookstores, or online at Amazon.com, Apple iTunes store, or Barnes and Noble. For additional information or inquiries about “How To Experience Victory In Your Storm”, contact the Christian Faith Publishing media department at 866-554-0919.